Jim Learned - Player Rep.
For more Team News including stories, team events, game summaries, and players of the week dating back to last year- click on the 'C.I.B. NEWS' tab located in the upper left of the page. 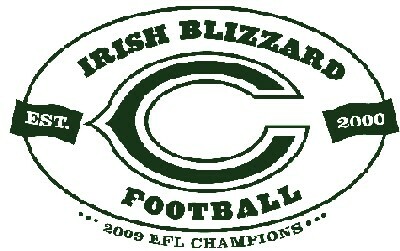 For a brief look at the origin of the Clinton Irish Blizzard as well as season results and award winners from the first eleven seasons (2000 - 2010) in the Eastern Football League, click on the link above or click on the 'C.I.B. HISTORY' tab at the upper left of the page. 38 visitors have signed our guestbook.